Constitution and Rules of the Communist International. 1. The Communist International-the International Workers’ Association-is a union of Communist Parties in various countries; it is a World Communist Party. As the leader and organiser of the world revolutionary movement of the proletariat and the upholder of the principles and aims of Communism, the Communist International strives to win over the majority of the working class and the broad strata of the property-less peasantry, and fights for the establishment of the world dictatorship of the proletariat, for the establishment of a World Union of Socialist Soviet Republics, for the complete abolition of classes and for the achievement of socialism-the first stage of Communist society. 2. The various Parties affiliated to the Communist International are called the Communist Party of .......................... [name of country] (Section of the Communist international).In any given country there can be only one Communist Party affiliated to the Communist International and representing its Section in that country. 3. Membership of the Communist Party and of the Communist International is open to all those who accept the programme and rules of the given Communist Party and of the Communist International, who join one of the basic units of a Party, actively work in it, abide by all the decisions of the Party and of the Communist International, and regularly pay Party dues. 4. The basic unit of the Communist Party organisation is the nucleus in the place of employment (factory, workshop, mine, office, store, farm, etc.) which unites all the Party members employed in the given enterprise. 5. The Communist International and its Sections are built up on the basis of democratic centralism, the fundamental principles of which are: (a) election of all the leading committees of the Party, subordinate and superior (by general meetings of Party members, conferences, congresses and international congresses); (b) periodical reports by leading Party committees to their constituents; (c) decisions of superior Party committees to be obligatory for subordinate committees, strict Party discipline and prompt execution of the decisions of the Communist International, of its leading committees and of the leading Party centres. Party questions may be discussed by the members of the Party and by Party organisations until such time as a decision is taken upon them by the competent Party committees. After a decision has been taken by the Congress of the Communist International, by the Congress of the respective Sections, or by leading committees of the Comintern and of its various Sections, these decisions must be unreservedly carried out even if a Section of the Party membership or of the local Party organisation is in disagreement with it. In cases where a Party exists illegally, the superior Party committees may appoint the subordinate committees and co-opt members on their own\ committees, subject to subsequent endorsement by the competent superior Party committees. 6. In all non-Party workers’ and peasants’ mass organisations and in their leading committees (trade unions, co-operative societies, sport organisations, ex-service men’s organisations, and at their congresses and conferences) and also on municipal bodies and in parliament, even if there are only two Party members in such organisations and bodies, Communist fractions must be formed for the purpose of strengthening the Party’s influence and for carrying out its policy in these organisations and bodies. 7. The Communist fractions are subordinated to the competent Party bodies. Note: 1. Communist fractions in international organisations (Red International of Labour Unions, International Class War Prisoners’ Aid Society, International Red Aid Society, etc. ), are subordinate to the Executive Committee of the Communist International. Note: 2. The organisational structure of the Communist fractions and the manner in which their work is guided are determined by special instructions from the Executive Committee of the Communist International and from the Central Committees of the given Sections of the Comintern. II. The World Congress of the Communist International. 8. The supreme body of the Communist International is the World Congress of representatives of all Parties (Sections) and organisations affiliated to the Communist International. ‘ The World Congress discusses and decides the programme, and tactical and organisational questions connected with the activities of the Communist International and of its various Sections. Power to alter the programme and rules of the Communist International lies exclusively with the World Congress of the Communist International. The World Congress shall be convened once every two years. The date of the Congress and the number of representatives from the various Sections to the Congress to be determined by the Executive Committee of the Communist International. The number of decisive votes to be allocated to each Section at the World Congress shall be determined by a special decision of the Congress itself, in accordance with the membership of the given Party and the political importance of the given country. Delegates to the Congress must have a free mandate; no imperative mandate can be recognised. 9. Special Congresses of the Communist International shall be convened on the demand of Parties which, at the preceding World Congress had an aggregate of not less than one-half of the decisive votes. 10. The World Congress elects the Executive Committee of the Communist International (E.C.C.I. ), and the International Control Commission (I.C.C.). 11. The headquarters of the Executive Committee is decided on by the World Congress. III. The Executive Committee of the Communist International and its Subsidiary Bodies. 12. The leading body of the Communist International in the period between Congresses is the Executive Committee, which gives instructions to all the Sections of the Communist International and controls their activity. The E.C.C.I. 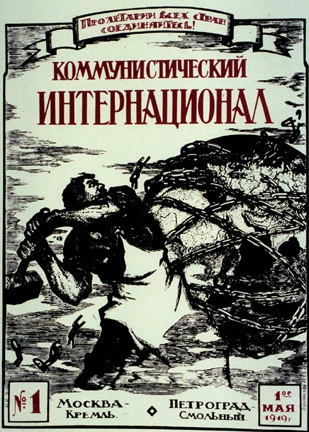 publishes the Central Organ of the Communist International, in not less than four languages. 13. The decisions of the E.C.C.I. are obligatory for all the Sections of the Communist International and must be promptly carried out. The Sections have the right to appeal against decisions of the E.C.C.I to the World Congress, but must continue to carry out such decisions pending the decision of the World Congress. 15. The E.C.C.I. has the right to expel from the Communist International, entire Sections, groups and individual members who violate the programme and rules of the Communist International or the decisions of the World Congress and of the E.C.C.I. Persons and bodies expelled have the right of appeal to the World Congress. 16. The programmes of the various Sections of the Communist International must be endorsed by the E.C.C.I. In the event of the E.C.C.I. refusing to endorse a programme, the Section concerned has the right to appeal to the World Congress of the Communist International. 17. The leading organs of the press of the various Sections of the Communist International must publish all the decisions and official documents of the E.C.C.I. These decisions must, as far as possible, be published also in the other organs of the Party press. 18. The E.C.C.I. has the right to accept affiliation to the Communist International of organisations and Parties sympathetic to Communism, such organisations to have a consultative voice. 19. The E.C.C.I. elects a Presidium responsible to the E.C.C.I., which acts as the permanent body carrying out all the business of the E.C.C.I. in the interval between the meetings of the latter. 20. The E.C.C.I. and its Presidium have the right to establish Permanent Bureaux (Western European, South American, Eastern and other Bureaux of the E.C.C.I. ), for the purpose of establishing closer contact with the various Sections of the Communist International and in order to be better able to guide their work. Note: The scope of the activities of the permanent bureaux of the E.C.C.I. shall be determined by the E.C.C.I. or by its Presidium. The Sections of the Communist International which come within the scope of activities of the permanent bureaux of the E.C.C.I. must be informed of the powers conferred on these bureaux. 21. The Sections must carry out the instructions of the permanent bureaux of the E.C.C.I. Sections may appeal against the instructions of the permanent bureaux to the E.C.C.I or to its Presidium, but must continue to carry out such instructions pending the decision of E.C.C.I. or of its Presidium. 22. The E.C.C.I. and its presidium have the right to send their representatives to the various Sections of the Communist International. Such representatives receive their instructions from the E.C.C.I. or from its Presidium, and are responsible to them for their activities. Representatives of the E.C.C.I. have the right to participate in meetings of the central Party bodies as well as of the local organisations of the Sections to which they are sent. Representatives of the E.C.C.I. must carry out their commission in close contact with the Central Committee of the Section to which they are sent. They may, however, speak in opposition to the Central Committee of the given Section, at Congresses and Conferences of that Section, if the line of the Central Committee in question diverges from the instructions of the E.C.C.I. Representatives of the E_C.C.I. are especially obliged to supervise the carrying out of the decisions of the World Congresses and of the Executive Committee of the Communist International. The E.C.C.I. and its Presidium also have the right to send instructors to the various Sections of the Communist International. The powers and duties of instructors are determined by the E.C.C.I., to whom the instructors are responsible in their work. 23. Meetings of the E.C.C.I. must take place not less than once every six months. A quorum consists of not less than one-half of the membership of the E.C.C.I. 24. Meetings of the Presidium of the E.C.C.I. must take place not less than once a fortnight. A quorum consists of not less than one-half of the membership of the Presidium. 25. The Presidium elects the Political Secretariat, which is empowered to take decisions, and which also prepares questions for the meetings of the E.C.C.I. and of its Presidium, and acts as their executant body. 26. The Presidium appoints the editorial committees of the periodical and other publications of the Communist International. 27. The Presidium of the E.C.C.I. sets up a Department for Work among Women Toilers, permanent committees for guiding the work of definite groups of Sections of the Communist International (National Secretariats) and other departments for its work. IV. The International Control Commission. 28. The International Control Commission investigates matters concerning the unity of the Sections affiliated to the Communist International and also matters connected with the Communist conduct of individual members of the various Sections. For this purpose the I.C.C. (c) Audits the accounts of the Communist International. The International Control Commission must not intervene in the political differences or in organisational administrative conflicts in the Communist Parties. The headquarters of the I.C.C. are fixed by the I.C.C., in agreement with the E.C.C.I. V. The Relationships between the Sections of the Communist International and E.C.C.I. 29. The Central Committee of Sections affiliated to the Communist International and the Central Committees of affiliated sympathising organisations must send to the E.C.C.I. the Minutes of their meetings and reports of their work. 30. Resignation from office by individual members or groups of members of Central Committees of the various Sections are regarded as disruptive of the Communist movement. Leading posts in the Party do not belong to the occupant of that post, but to the Communist International as a whole. Elected members of the Central leading bodies of the various Sections may resign before their time of office expires, only with the consent of the E.C.C.I. Resignations accepted by Central Committees of Sections without the consent of the E.C.C.I. are invalid. 31. The Sections affiliated to the Communist International must maintain close organisational and informational contact with each other, arrange for mutual representation at each other’s conferences and congresses, and, with the consent of the E.C.C.I., exchange leading comrades. This applies particularly to the Sections in imperialist countries and their colonies, and to the Sections in countries adjacent to each other. 32. Two or more Sections of the Communist International which (like the Sections in the Scandinavian countries and in the Balkans) are politically connected with each other by common conditions of struggle, may, with the consent of the E.C.C.I., form federations for the purpose of co-ordinating their activities, such federations to work under the guidance and control of the E.C.C.I. 33. The Sections of the Comintern must regularly pay affiliation dues to the E.C.C.I. ; the amount of such dues to be determined by the E.C.C.I. 34. Congresses of the various Sections, ordinary and special, can be convened only with the consent of the E.C.C.I. In the event of a Section failing to convene a Party Congress prior to the convening of a World Congress, that Section, before electing delegates to the World Congress, must convene a Party conference, or Plenum of its Central Committee, for the purpose of preparing the questions for the World Congress. 35. The International League of Communist Youth (Communist Youth International) is a Section of the Communist International with full rights and is subordinate to the E.C.C.I. 36. The Communist Parties must be prepared for transition to illegal conditions. The E.C.C.I. must render the Parties concerned assistance in their preparations for transition to illegal conditions. 37. Individual members of Sections of the Communist International may pass from one country to another only with the consent of the Central Committee of the Section of which they are members. Communists changing their domicile must join the Section in the country of their new domicile. Communists leaving their country without the consent of the Central Committee of their Section, must not be accepted into other Sections of the Communist International.